The azalea plant is part of the genus Rhododendron and has varieties that are evergreen and deciduous. Azaleas are hardy to plant in Georgia as it is part of the USDA growing zones 6 through 8. The plant will bloom in the months of April and May and some varieties will have an additional bloom time in the fall season. Azaleas planted in Georgia must be watered to keep the soil moist during the growing season as the climate has periods of drought in the summer months. Select a planting site for the azalea that offers a well draining, moist soil and filtered shade light conditions. The plant prefers filtered morning sun for flower formation. 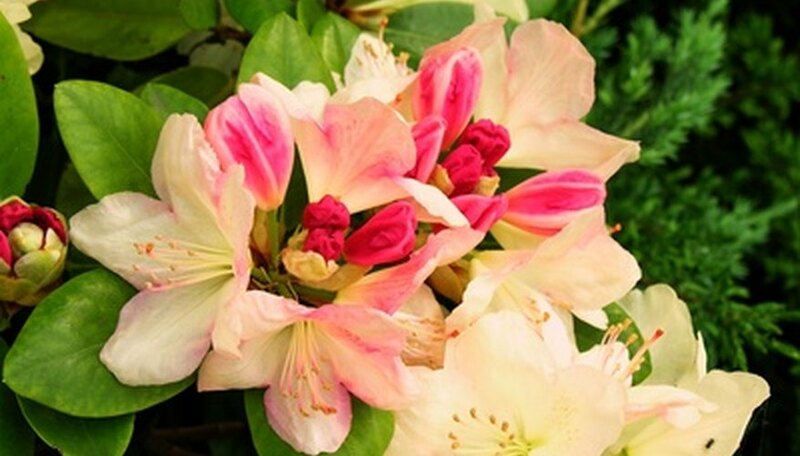 Test the soil pH as the azalea plant prefers an acidic soil that has a pH of 4.5 to 6.0. Work ground rock sulfur into the soil to lower the pH number. Let the soil rest for two weeks prior to planting. Plant the azalea in a hole that is twice as wide as the root ball and the same depth. Fill the hole with water and let it absorb into the surrounding soil. Mix organic compost into the removed soil. Set the plant into the hole and fill gently pack the mixture around the roots. Water the azalea generously after planting. Continue to water the plant throughout the growing season by applying one inch of water when the soil becomes dry. Azalea plants do not tolerate drought or excessively wet environments. Keep the soil evenly moist throughout the season for best results. Fertilize azalea plants by applying a broadcast fertilizer 4 to 6 inches from the stem of the plant after blooming is complete. Do not allow the fertilizer to touch the plant, as azaleas are tender and can be burned by heavy chemical applications. Apply a 3- to 4-inch later of organic mulch around the plants to conserve soil moisture and prevent weed growth. Leave a 1-inch gap between the plant stem and start of mulch to prevent wood decay. Prune azalea plants after the flowering period but before July 1. Remove tall growth and suckers growing from the ground if needed. Only prune to shape the plant and create a desired look. Do not plant azaleas under trees as the roots will compete for nutrients and moisture.